Plenty of businesses see the holidays as a time to attract new customers. They open their sack full of gifts and offer discounts, coupons and generally get into the spirit of the season. But I’m nagged by doubts about this strategy. Nagging Doubt 1: Will they come? You’ve got to place some bets when you discount, right? You want to attract business, so you want to offer something desirable. Do you know non-customers well enough to guess at what they want? It’s not like you’ve got copies of their Christmas Lists. But let’s say you guess and you guess RIGHT – and they DO take advantage of your discounts and redeem your coupons. Nagging Doubt 2: Will they come back? It’s heavenly to see that December sales bulge – like Santa’s belly – but so deflating to see the trend line fall back to normal in Jan/Feb/Mar. Can you design a promotion that will grab new customers in the holidays – and bring ‘em back in the new year? Instead of using your holiday promotion to change the behavior of customers you don’t know yet, what if you use your holiday promotion to reward the behaviors of customers you know well – your best customers? Surprises are so nice and …surprising in business. Yesterday I was at Panera Bread, ordering a soda and pumpkin muffin to assuage my guilt about using their wi-fi for the next two hours. When the cashier swiped my Panera card, she said “Oh! You get $1 off a beverage purchase. Would you like to take that now?” $1 off a $4 order? Heck yeah. Can you offer your best customers something delightful, surprising, that shows you’re paying attention and trying to offer a great value? And when you do – can you make it easy to share? I’m including Panera’s promotion in this post, so you know I favor Panera. Panera didn’t ask me to tell you about their $1 gift. Panera didn’t offer to reward me if I evangelize for them this holiday season. Panera didn’t ask me, a good customer, to help them attract new customers. But it could have done. And so can you. 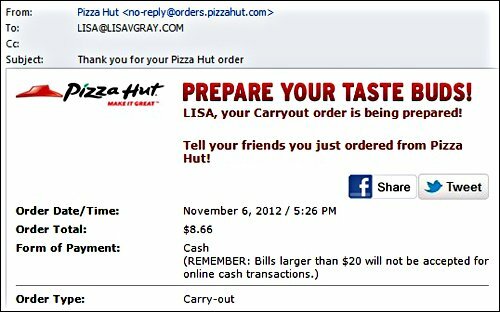 I did NOT share this with my friends, because I have not been a regular customer of Pizza Hut since my junior year in high school (Go Mustangs!). But if I were a regular customer, and if it were this easy, I just might recommend a vendor this way. Even more persuasive would be a face-2-face recommendation. If you’re a restaurant, can you offer your best customers a buy-one-get-one if they bring their family to your place over the holidays? And when they bring the family, what can you do to make your customer feel like a rock star in front of the whole clan? Can you create an experience that they’ll be talking about for many Christmases to come? experiences your customers will share with friends & family – your prospective customers. 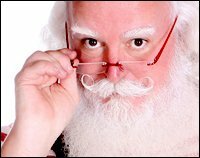 When it comes to holiday promotions, Santa & I are on the same page: be nice to The Nice Ones. What great promotions (holiday or other) have you used to reward your best customers? Have you been rewarded by your favorite businesses? I would love to hear about it – and learn from it!